Interspersed Distribution of Selectivity to Kinematic Stimulus Features in Supragranular Layers of Mouse Barrel Cortex. Neurons in the primary sensory regions of neocortex have heterogeneous response properties. 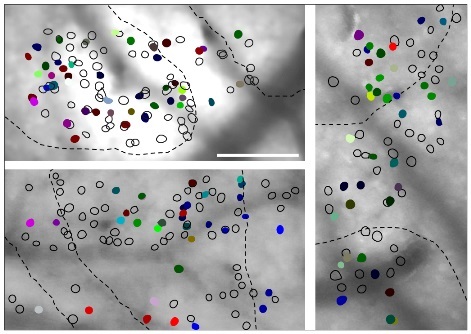 The spatial arrangement of neurons with particular response properties is a key aspect of population representations and can shed light on how local circuits are wired. Here, we investigated how neurons with sensitivity to different kinematic features of whisker stimuli are distributed across local circuits in supragranular layers of the barrel cortex. Using 2-photon calcium population imaging in anesthetized mice, we found that nearby neurons represent diverse kinematic features, providing a rich population representation at the local scale. Neurons interspersed in space therefore responded differently to a common stimulus kinematic feature. Conversely, neurons with similar feature selectivity were located no closer to each other than predicted by a random distribution null hypothesis. This finding relied on defining a null hypothesis that was specific for testing the spatial distribution of tuning across neurons. We also measured how neurons sensitive to specific features were distributed relative to barrel boundaries, and found no systematic organization. Our results are compatible with randomly distributed selectivity to kinematic features, with no systematic ordering superimposed upon the whisker map.